Endings and beginnings. This month I seem to be in the midst of both of these passages. Everywhere I turn, it seems there’s another ending — a change, a loss, a time to say goodbye. But lest I get too caught up in grieving the passing of a season, I can’t help but see the seeds of new beginnings all around me as well. Endings. I’m happy to say goodbye to a long, cold, wet winter. Days on end of grey sky and damp weather. People commented that it was like living in Seattle, without the beautiful coastline. Spring is finally here, and the flowers and everything green is now growing with a vengeance! On warm, sunny days, it’s hard to be inside. Beginnings. Outside was where I would see Mr. Black, the farmer who we purchased our property from back in 1992. Over the years, he was always on his tractor, transporting round bales of hay for his cows or on the way to fertilize or seed a field. 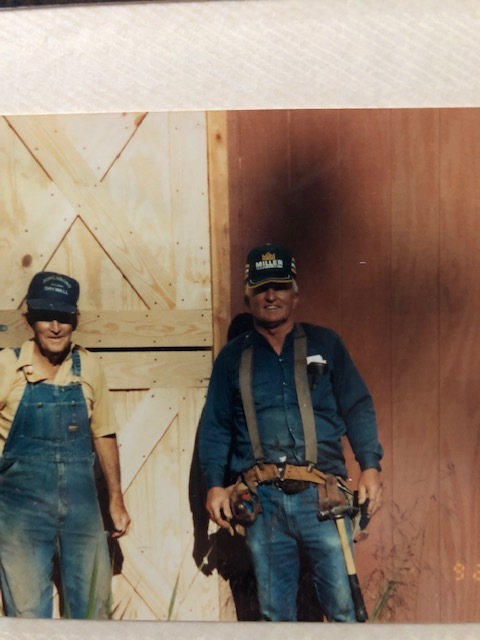 John Black built our barn in 1994. He and his family welcomed us to this corner of North Carolina. John Black was strong, kind, sturdy. He wore blue jeans and denim or flannel shirts. He built our barn, cut hay off our pastures, chainsawed trees that fell across our driveway. He kept an eye on things and was often the first one to call us if something was amiss. He loved to tell stories and laugh, and he was never in a rush. 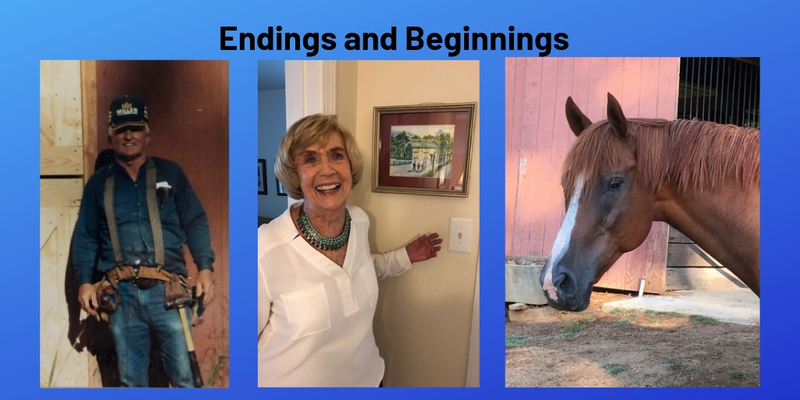 Even at the age of 88, during the last week of his life, he lingered, telling me about “an ole horse he used to ride.” He had the same sparkle in his eye that I had grown to love. But a few days later, the candle within him dimmed and blew out. I wasn’t ready to say goodbye. But it was time. Endings. His granddaughters brought tears to my eyes as they gave his eulogy — sharing memories of a well-loved man. Granddaughters, who we knew when they were kids, the younger one was one of my daughter’s first babysitters, granddaughters who are now mothers with children of their own. Beginnings. Our goodbye lunch for Jean. Endings. Sitting around a table with dear writer friends, saying goodbye to Jean, who kept us in line with her pen tapping. Twenty-five years of friendship, sharing stories of our lives, unearthing the hurts and joys, the parts of us who made us who we were, shaping me into who I would become. Jean in front of a picture of her father’s pub. 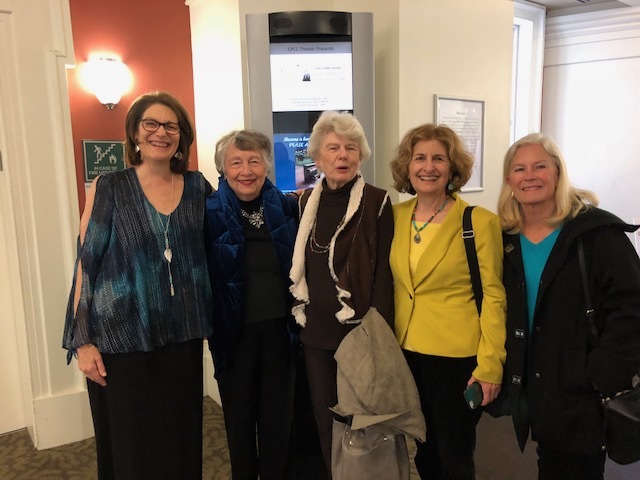 These women helped midwife my memoir, a labor of twenty years where I brought them chapter after chapter. Their kindness and wisdom folded into me. We listened carefully to each word shared, celebrated each other’s successes, mourned each other’s losses. 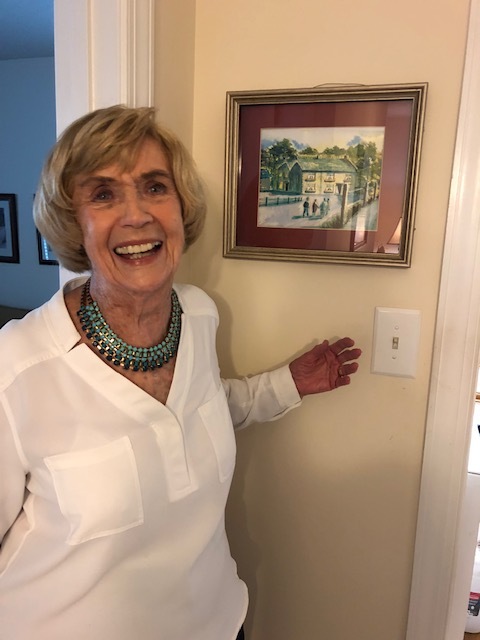 Jean came from Liverpool and introduced us to life during the war, her father’s pub, her bicycle-racing years, her beloved Sonny who brought her to America and grew tomatoes for her. Jean’s novels were full of adventure and the spirit of a woman we grew to love. And now she is leaving, returning home to England. It’s appropriate and beautiful, this coming full circle and living her last years with nieces and nephews who adore her. An ending for us, a beginning for her. Endings. This weekend, Shady is being sold. A beautiful horse whose coloring reminded me of my beloved Crimson. Shady’s owners, family friends, are transitioning into a different circumstance, and after three years, have decided it was time to let him go. Shady will be moving to a new farm where he will have a job and be engaged in happy work for a horse. It is right and it is good. But it’s a change. Foxie and Shady have been pasture mates for years, and we will miss him, even though he drove us crazy at times. I will always have a vision of the two of them side by side, Foxie’s head low, Shady’s head high, as they walked through the tall grass, companions for a time. 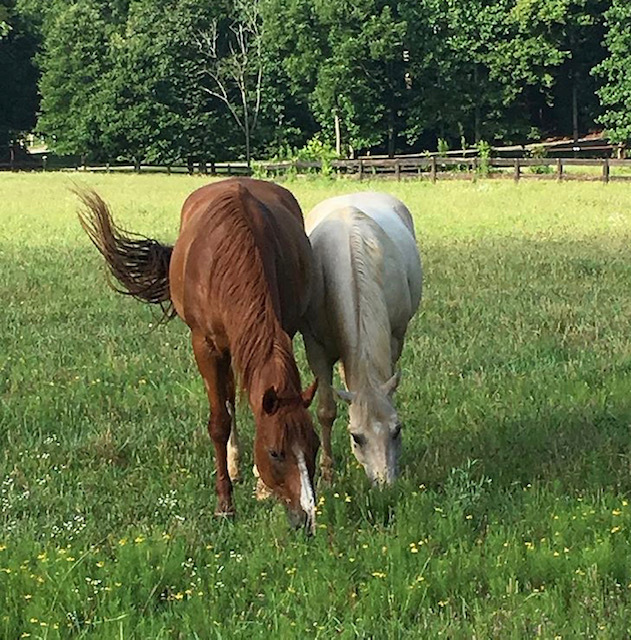 Shady will have a new beginning as will Foxie as she returns home (after being boarded) with a new companion, a little mare named Ruby. A mare similar in color to Shady, but smaller and older. We hope that Foxie and Ruby will become friends. Only time will tell. Endings and beginnings. The taste of sorrow and sweetness on our tongues. The end of an era. A time past. These phrases float up and ride within me. Tomorrow will be different from yesterday. A new landscape, a shifting sky. I never quite understood until this year how in the midst of each ending a new beginning is cradled. I’ve been thinking a lot about circles of support in my life this week. Some of those circles have overlapped and intersected recently. Today, a very special cruise to the Caribbean begins. 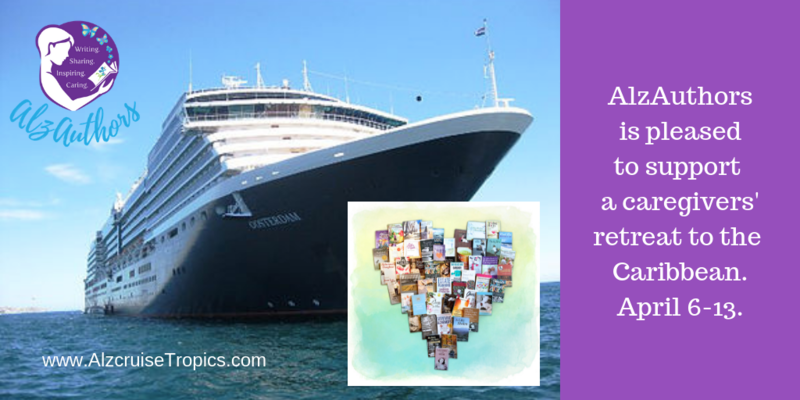 I won’t be on this cruise, but both my heart and my memoir, Motherhood: Lost and Found, will be. Creating Circles of Care and Building Bridges of Hope is a dementia cruise and conference created by my friend Lisa Marie Chirico. For the past several months, I’ve been working hard alongside the management team of AlzAuthors (Marianne Sciucco, Kathryn Harrison, Jean Lee, Vicki Tapia and Irene Frances Olson) to create The AlzAuthors Inspiration Collection, extraordinary books about Alzheimer’s and dementia. This collection is made up of over 35 books carefully chosen around the needs of cruise and conference attendees. 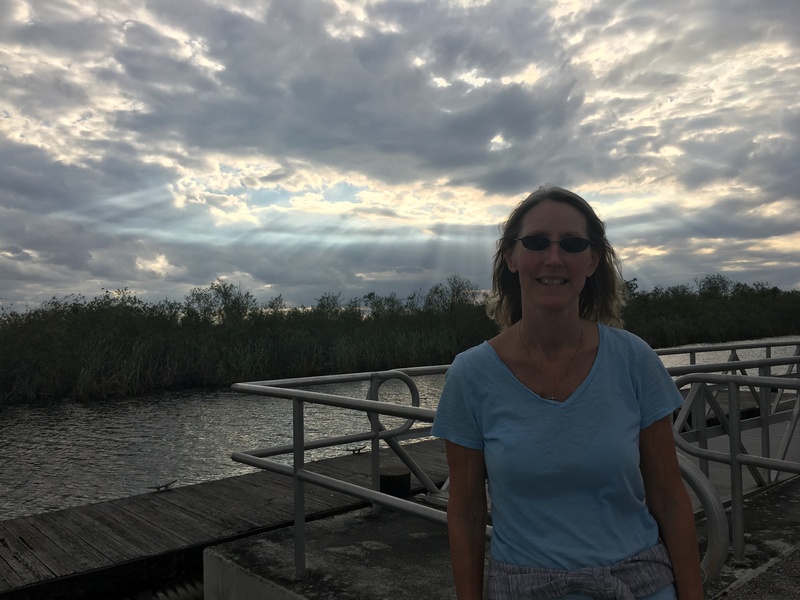 Having been a caregiver for my mother who had Alzheimer’s for 14 years, I remember telling Lisa that I used to dream about running away from it all and taking a cruise. Caregiving had taken a toll on me. If I’d had the opportunity to gather my family and take my mother with us on a cruise to a tropical destination, I would’ve done it in a heartbeat. When you are a caregiver, it’s easy to forget who you are. I’ve been blessed to be nourished by several communities that have reminded me over the years who I am. 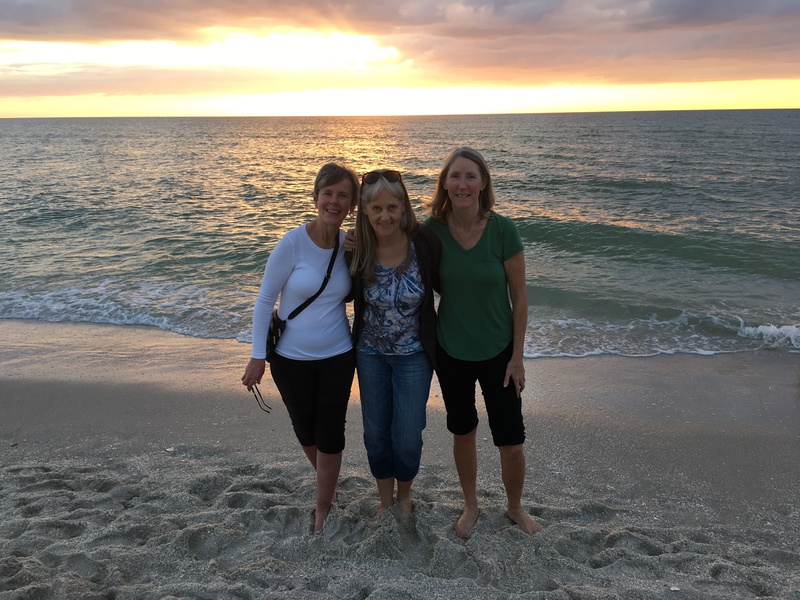 One of them is the team of women who manage AlzAuthors.com. 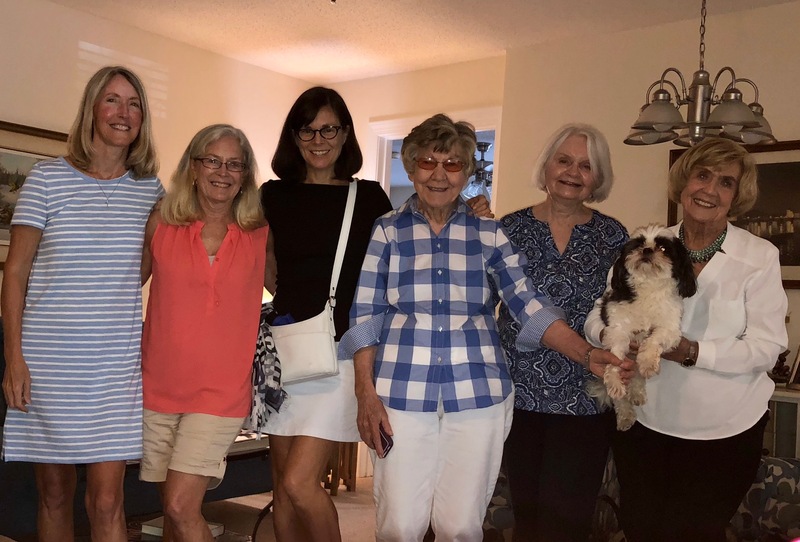 Marianne, Kathryn, Jean, Vicki, Irene and I share the experience of being writers AND caregivers. Now, we work daily to gather and share information about good books about Alzheimer’s and dementia in order to light the way for others on this path. Another circle of support is my long-time Thursday writers’ group. For years we met weekly, supporting and critiquing each other’s work. 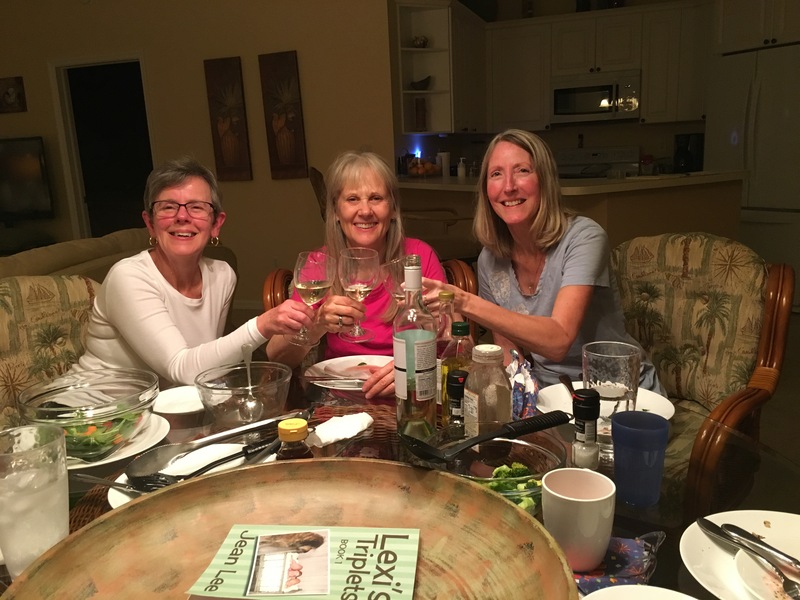 Now, we gather on rare occasions to reconnect, celebrate book releases and share our writing. 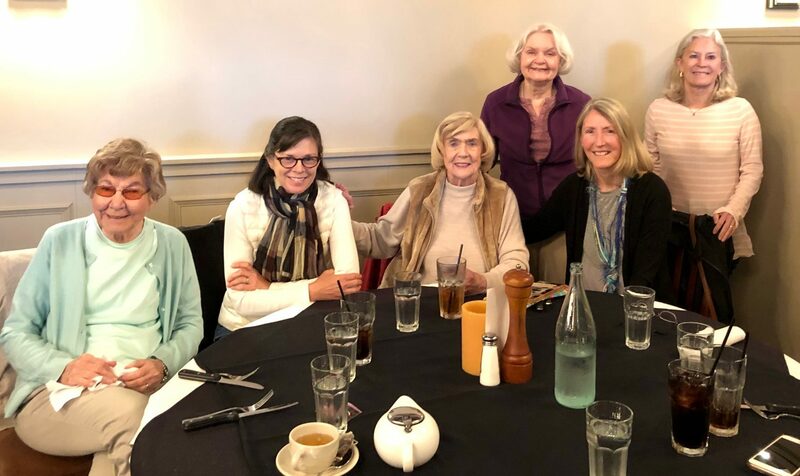 Yesterday, we met for lunch to say goodbye to our beloved honorary “pen tapper” Jean Beatty, who kept us on task each week. She is returning home to England at the young and lively age of 89. What a gift it has been to share writing and life with her and the rest of our group. A third circle of support is my Charlotte area writing community. This time of year, we celebrate Sensoria – or what used to be called the CPCC Literary Festival. Over the years, I attended every chance I got. I had the opportunity to listen to world-renowned writers such as Robert Haas, Mary Oliver, Lee Young Lee and so many others. 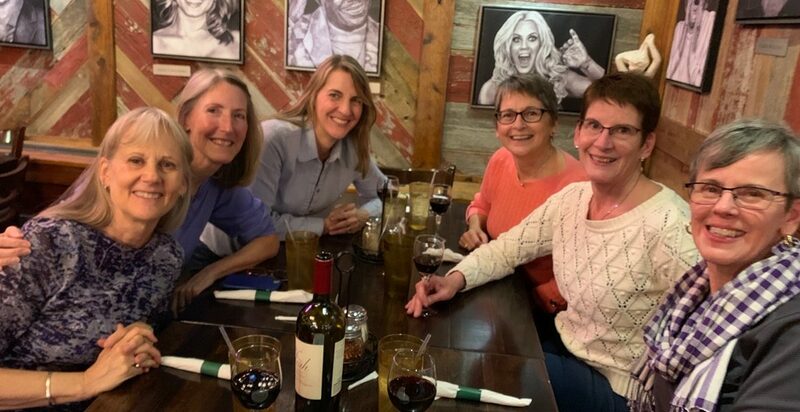 Writing friends, some of whom I only see once a year, congregate joyfully to soak in the literary talents throughout the week. The spring after my daughter was born, I remember asking my husband to deliver her to me at the festival, so I could breastfeed her between events. Joel knew how much it meant to me, and he was happy to oblige. I’m blessed to have other communities that provide support to me as well. Today, I stand in awe of and want to honor these sweet circles that enrich my life. It’s a rare opportunity when you get to honor your mentor, who is alive and well, still reading poetry and teaching at the age of 84. This, after a bout of lung cancer and dealing with chemo and radiation, which makes it all the more meaningful. What an honor it is to celebrate Tony Abbott during National Poetry Month. I was so pleased to have him introduce me at the launch party of The Beach Poems. See previous post here. April is National Poetry Month, a perfect time to reminisce over my early days as a poet and the gifts I’ve received from Tony Abbott. I spent those days searching for the next line that would move me deeply, digging into my past, roaming beyond the ragged edges of my heart, seeking something bright and unexpected – the sun rising over a new land created through language. In short, I wanted to be broke open and reformed – again and again. 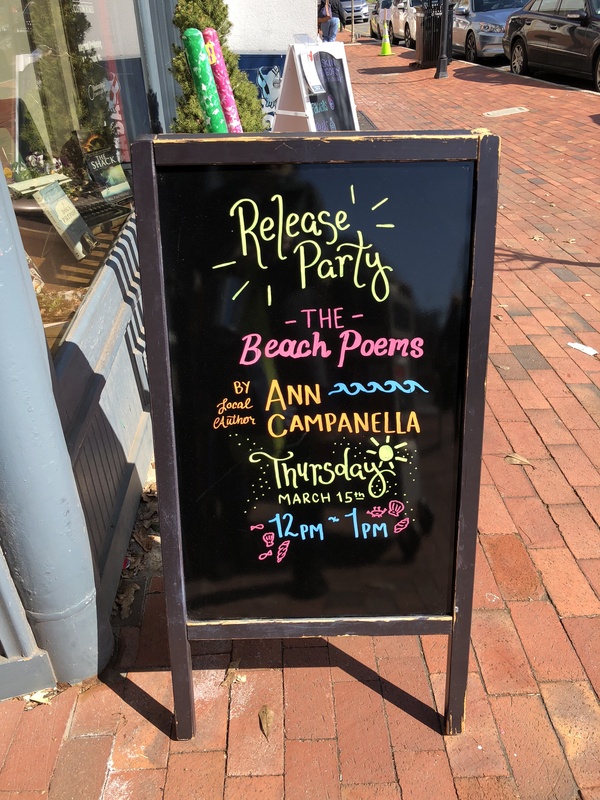 On the Ides of March, there was a book launch party for The Beach Poems. 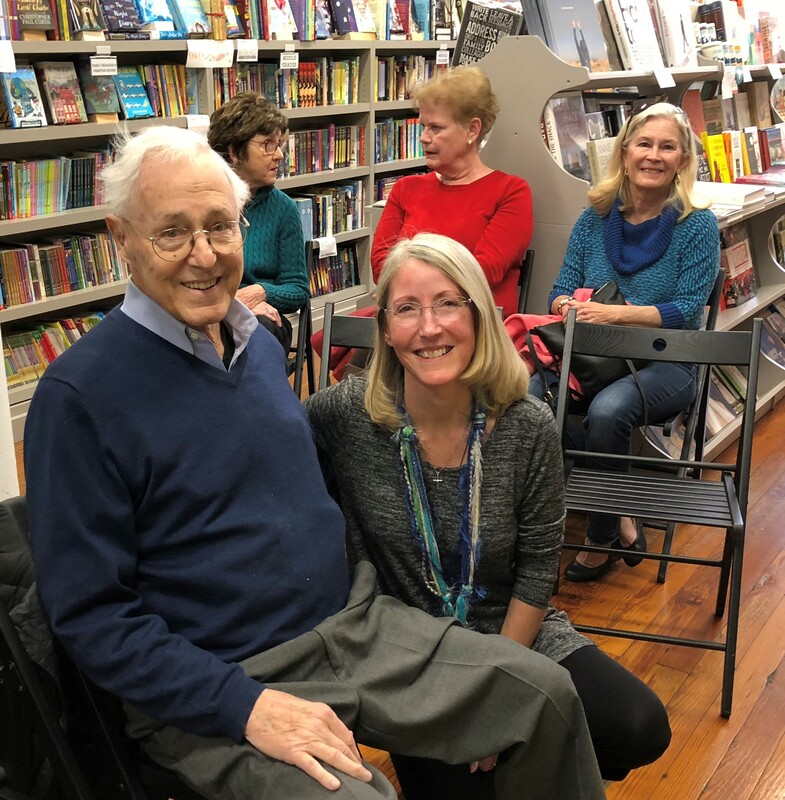 I started the day fearful that it would be an embarrassment, that so few people would come that the bookstore would lose money and the kind staff who supported this event would never want me to show my face there again. This is what the mind does – spiral and spiral until we are cringing at our own unworthiness. Fortunately, I was blessed to have an incredibly supportive core of women, part of the CWC-N board who assured me not only that they would be there (they put on the book launch party and made the entire thing a piece of cake, so that I could sweep in and not lift a finger), but that no matter who showed up, they were looking forward to an afternoon of sharing time together, listening to my poems and celebrating our love of all things literary.